Mykonos has been known as a party town and truly is! But is also a very beautiful island with many sights. Walk through the narrow winding stoned pathways, admire the shops, eat at the small crepe shops or at the several Greek and Italian restaurants, and party at cafes with techno music. Then find a place to sit and view the amazing sunset behind the windmills and the boats on the water. Don't forget to visit Little Venice. Its a popular neighborhood and is called Little Venice because the houses are built over the sea. Visit also Matogiannia a cosmopolitan spot in the heart of Mykonos Town. Go to the Archaeological Museum, which was founded in 1905 and houses finds from the neighboring island Rinia. The Archaeological Museum of Mykonos is small but has major archaeological collections of pottery, sculptures, vessels, ceramics, gravestones and more, that were moved from ancient Delos, the birthplace of Apollo, the God of Light. Make also a visit to the Folklore Museum and the Maritime Museum. If you love art, go to the Municipal Art Gallery, where you can admire works of Greek and foreign artists. Take a stroll at the outdoor amphitheater, in Mycenaean tomb (14th-13th century BC.) and at the 'Fountain'. On the island there are over 600 churches of various types, from churches to very old monasteries like Marathi, a monastery-castle, with square shape, founded by the monks Kampourakis and Gerasimos in 1665. The monastery has beautiful icons in wooden temple. And also like the church of Virgin Paraportiani from the 15th century. Mykonos has many archaeological sites. In various parts of the island visitors can see preserved towers. One of them is the Mavrospilia where found many tools and objects of the Neolithic era. Also you can visit the Angelic Mycenaean tomb from 15th BC century. 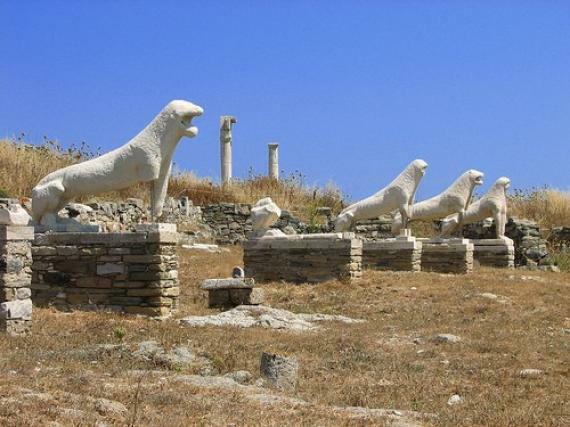 Very close to Mykonos is Delos the sacred island of Apollo, which inhabited the early 10th century BC. The entire island is now an open museum. Worth visiting is also the lighthouse Armenistis, in the homonymous cape, built in 1890 and has a height of 10 meters, the Tomb of Ftelia and the hill of Palaeokastro where you can see traces of ancient and Byzantine times. In the villages see the 'pigeon houses', with its elegant decor and the functionality in pigeon breeding. As you can imagine you have a lot to see here!